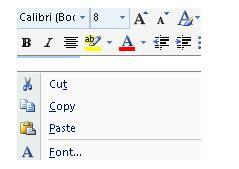 In Word, we can also apply the format we need to a portion of a document or to a complete document. We can change the font we are using as well as the writing style and colour. Let's learn how to apply a format to the text. Follow these steps to change the type of font. 2. Click on the Home tab on the Toolbar. 3. Locate the Font menu and open the dropdown window with font options by clicking on the arrow pointing down located to the left (see image). 5. 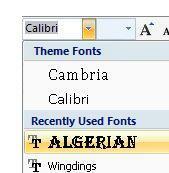 To change the size of the font, open its corresponding window and select the desired size. In this example, I have chosen size 8. This is the way our text will look like after changing its format. 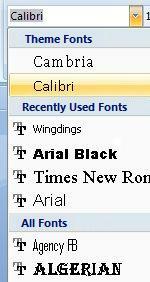 On this window, we can also select the type of font from the dropdown list of options. We can also change the font size.